The magnificent Barnett Hill Country House Hotel dates back to the early 1900s in the Queen Anne era. This Grade II listed building sits with 26 acres of beautiful gardens providing a peaceful setting for weddings. Kelly and Sean got married here in September and although it rained throughout the day, we certainly weren’t going to let the typical British weather put a dampener the day. Kelly got ready at home with her bridesmaids and the traditional oak beams in their characterful cottage made for a wonderful backdrop to the images. Upon arriving at Barnett Hill I headed around the grounds in the rain to get some scene setting shots before meeting Sean and the guests prior to the ceremony. After the vows I took the newlyweds around the gardens with their Mr & Mrs umbrella to get some relaxed shot of the two of them away from the guests. The cloudy weather made for some lovely saturated images outside whilst Kelly and Sean huddling under the umbrella added a real romantic feel to them. The decorations around the reception looked fantastic and the couple had clearly done an amazing job sourcing unique elements from wherever they could, taking their rustic chic theme to a whole new level! Once the meal got underway it was finally time for me to take a short break to dry myself and my equipment off before the speeches started. 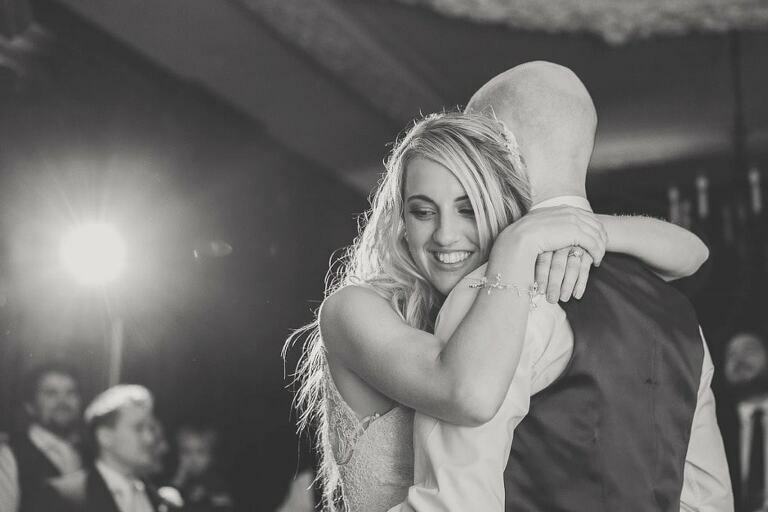 There was certainly love in the room with tears and laughter and as a documentary wedding photographer it’s always so important to me that I capture all of the special moments that I see taking place. The cake was soon cut and the dancing began with Kelly and Sean absolutely nailing their first dance. I really enjoyed capturing their wedding and despite getting soaked at certain times of the day I wouldn’t change anything. Here’s a selection of my favourites. To see more about weddings at Barnett Hill please click here.